The field of biotechnology is one of constant change. The rapid growth and development of cutting-edge research are dependent on the innovation and creativity of scientists and their ability to see the potential in a basic molecular technique and apply it to new processes. 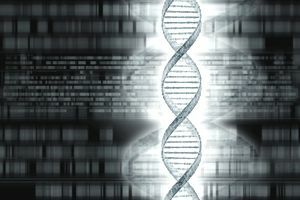 The advent of PCR opened up many doors in genetic research, including a means of DNA analysis and identification of different genes based on their DNA sequences. DNA sequencing is also dependent on our ability to use gel electrophoresis to separate strands of DNA that differ in size by as little as one base pair. In the late 1970's, two DNA sequencing techniques for longer DNA molecules were invented: the Sanger (or dideoxy) method and the Maxam-Gilbert (chemical cleavage) method. The Maxam-Gilbert method is based on nucleotide- specific cleavage by chemicals and is best used to sequence oligonucleotides (short nucleotide polymers, usually smaller than 50 base-pairs in length). The Sanger method is more commonly used because it has been proven technically easier to apply, and, with the advent of PCR and automation of the technique, is easily applied to long strands of DNA including some entire genes. This technique is based on chain termination by dideoxynucleotides during PCR elongation reactions. In the Sanger method, the DNA strand to be analyzed is used as a template and DNA polymerase is used, in a PCR reaction, to generate complementary strands using primers. Four different PCR reaction mixtures are prepared, each containing a certain percentage of dideoxynucleoside triphosphate (ddNTP) analogs to one of the four nucleotides (ATP, CTP, GTP or TTP). Synthesis of the new DNA strand continues until one of these analogs is incorporated, at which time the strand is prematurely truncated. Each PCR reaction will end up containing a mixture of different lengths of DNA strands, all ending with the nucleotide that was dideoxy labeled for that reaction. Gel electrophoresis is then used to separate the strands of the four reactions, in four separate lanes, and determine the sequence of the original template based on what lengths of strands end with what nucleotide. In the automated Sanger reaction, primers are used that are labeled with four different colored fluorescent tags. PCR reactions, in the presence of the different dideoxynucleotides, are performed as described above. However, next, the four reaction mixtures are then combined and applied to a single lane of a gel. The color of each fragment is detected using a laser beam and the information is collected by a computer which generates chromatograms showing peaks for each color, from which the template DNA sequence can be determined. Typically, the automated sequencing method is only accurate for sequences up to a maximum of about 700-800 base-pairs in length. However, it is possible to obtain full sequences of larger genes and, in fact, whole genomes, using step-wise methods such as Primer Walking and Shotgun sequencing. In Primer Walking, a workable portion of a larger gene is sequenced using the Sanger method. New primers are generated from a reliable segment of the sequence and used to continue sequencing the portion of the gene that was out of range of the original reactions. Shotgun sequencing entails randomly cutting the DNA segment of interest into more appropriate (manageable) sized fragments, sequencing each fragment, and arranging the pieces based on overlapping sequences. This technique has been made easier by the application of computer software for arranging the overlapping pieces.